I know many in my generation dislike the little red monster known as Elmo, feeling the character has somehow tainted the classic children's program Sesame Street. Not that today's toddlers and grade schooler care what a bunch of old fogies think; they love Elmo intensely. Regardless of how one feels about the muppet, however, it's pretty much impossible to feel anything but admiration and respect for the man who brings him to life, Kevin Clash. As we learn in the new documentary BEING ELMO, Kevin became obsessed with making muppets of his own almost as soon as he saw the debut of Sesame Street in 1969, when he was 9 years old. Not long after that, he made his first puppet by cutting up his father's trench coat. Fearing punishment, he was instead told simply to ask next time. Kevin's mother was just as supportive if not moreso, helping her son make some important early contacts. It was the perfect storm of talent, drive, familial support, and of course, luck. 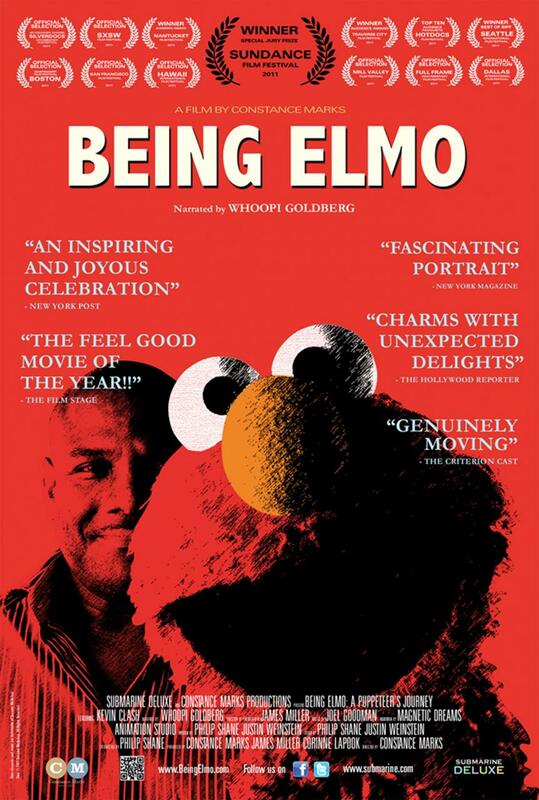 It really is impressive to see what the young Kevin Clash accomplished at such an early age simply from watching Sesame Street and The Muppets and doing his best to imitate it. Those skills alone were enough to get him on local TV in Baltimore, Maryland and eventually to the big time on the Captain Kangaroo show. Muppet builder Kermit Young also helped Kevin by mentoring the teenager when he was 17, eventually leading to Kevin meeting and working for his idol Jim Henson. And that's just the early part of Kevin's journey to portraying what is arguably the best known Muppet of all time. All through this documentary, you can't help but be struck by how genuine and sincere Clash comes across. Sure, he has his flaws, notably putting his work ahead of marriage and family. That's sad, but hardly surprising considering how many artists have had similar issues. Some people just aren't cut out for family life. Not only do we learn a great deal about Kevin's personal life and the forces that drove him to excel in his chosen career, but BEING ELMO also offers a fair amount of insight into the early Muppeteers as well. And seeing the kind of people that Jim Henson, Frank Oz, and Kermit Young were, you can't help but feel that Kevin Clash is a worthy successor. As for this film, it's a lot of fun yet not without substance. It's kind of inspirational in the way it shows how Kevin managed to achieve his dreams, and in the way he gives back in many ways, whether it be performing for charities or helping other young puppeteers. 4 out of 4 stars.